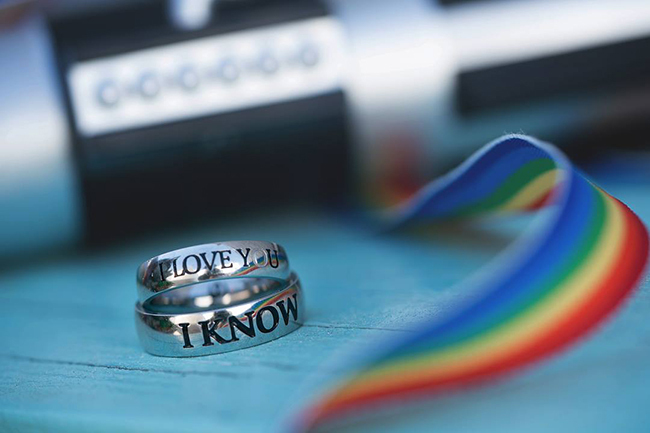 My good pal (and phenomenal Dungeon Master) Nikki Ward has taken all of these wonderful things and wrapped them into a fun Kickstarter project! Nikki ADORES Disneyland and visits more than most people I know (she and her husband even got married there). While I have yet to visit, I can’t help but me enamored by these adorable characters she’s created based on her favorite Park treats. Nikki is a professional illustrator located here in Austin, TX and draws some of the most adorable fanart I’ve ever seen. She travels a lot for shows that she exhibits at and her style is all her own. 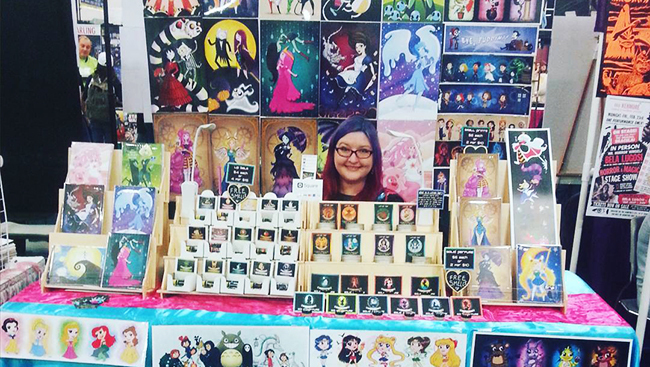 While she’s known for her Disney work, she also does fanart of Overwatch, Critical Role, and much more – you can find prints and other products on her Society6 page. Nikki is also the founder of Geek Fire Labs where she makes bath and body products that SMELL AMAZING. From where I’m currently sitting, I can see three of her products in my bedroom: a kodama forest wax melt, my Droid Please lip balm, and my favorite Cthulhu perfume. Seriously, her stuff is so great. As you can see, Nikki is a very skilled and experienced artist and maker. She’s made enamel pins before (I have her gorgeous Sailor Moon magical girl pin) but this is the first time she’s using Kickstarter as a platform for them. 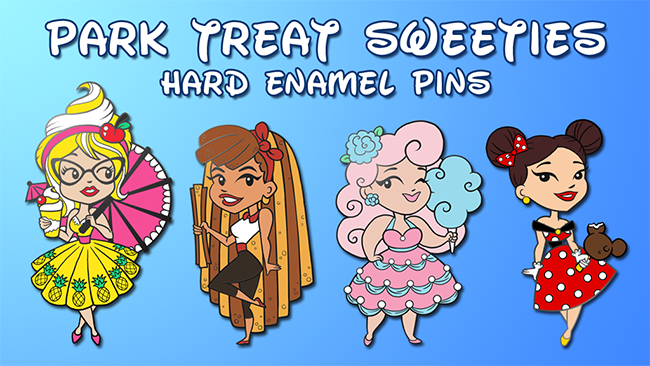 I’d love to see these Disney treat pins become a reality because they’re not only a personal passion of hers, they’re also just dang cute. 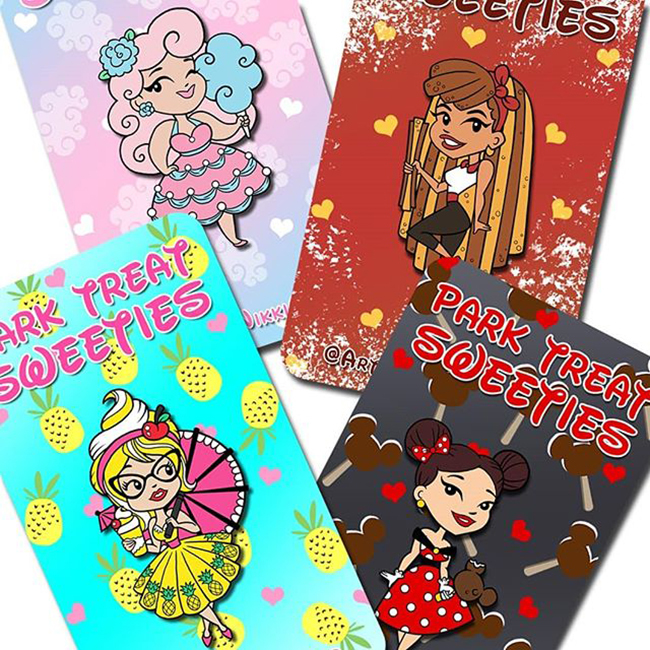 So please head over and pledge to the Park Treat Sweeties Hard Enamel Pins project. 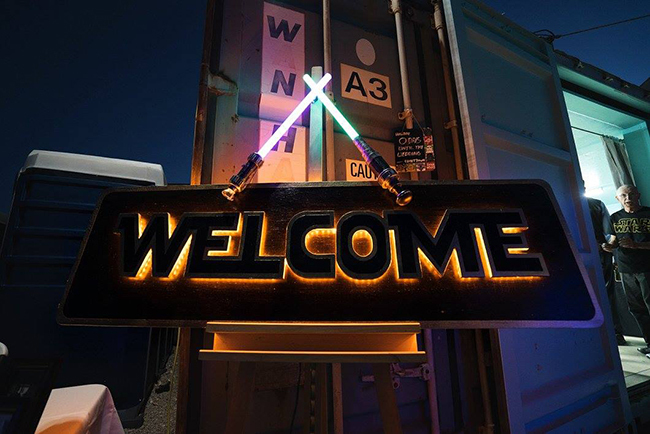 Happy Star Wars Day, my friends! 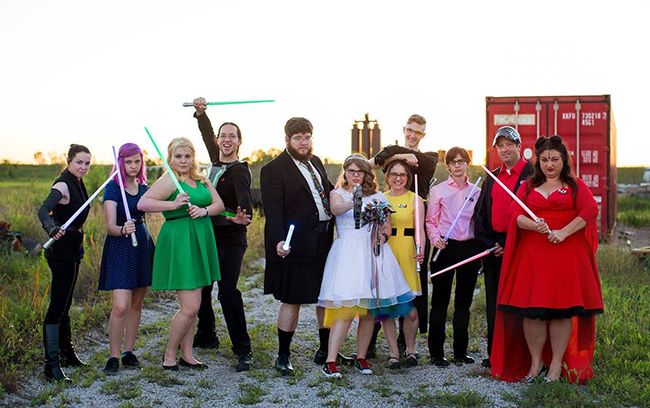 It’s always Star Wars day in our home, but we celebrate today anyway because it’s also our wedding anniversary. 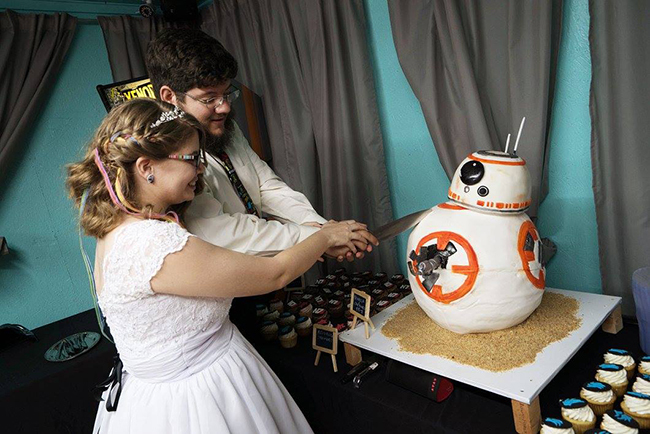 Two years ago today, in a galaxy not so far far away, Jake & I got married while our friends held lightsabers and everyone ate an almost life-sized with working flame BB-8 cake. 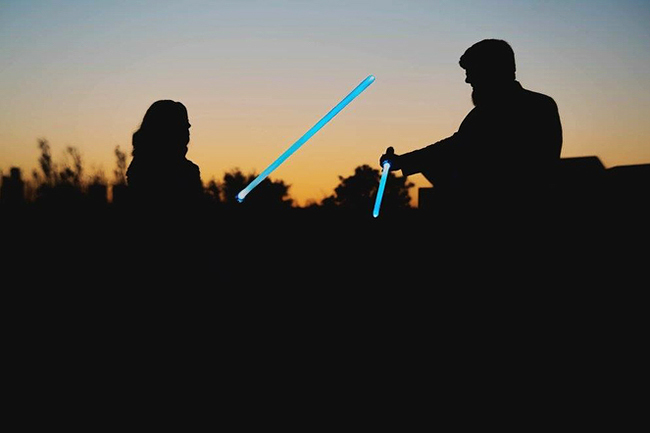 I might lean more towards the Dark Side, but I still love my Jedi husband. 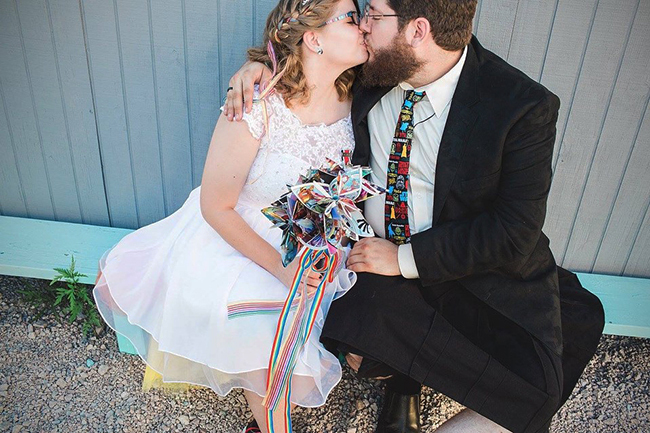 Honestly, I’m never going to be tired of looking at pictures from our wedding. 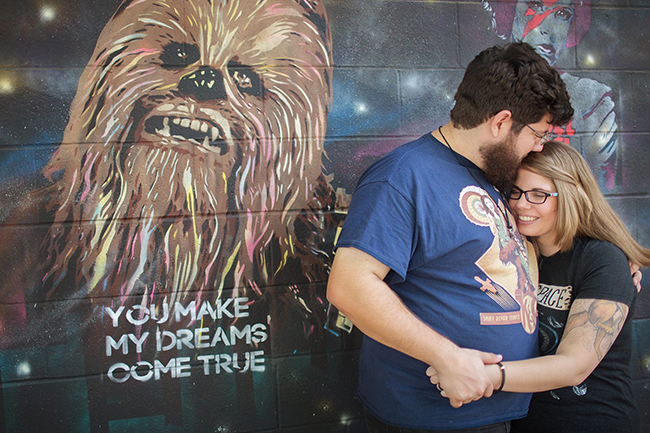 Partly because the day was a blur so I don’t actually remember much of it and pictures help, but mostly because it was just so perfect and so us and I’m just really glad this guy married me and that he loves Star Wars as much as I do. (We probably wouldn’t have gotten married if he wasn’t.) Fun story, when Jake first told his mom that he was dating someone, her first question was “Does she like Star Wars?” It was a match made in pre-explosion Alderaan.